The Oppressive Underpinnings of Language Interpretation – Raúl Quiñones-Rosado, Ph.D.
As fully bilingual Latino antiracism educators and organizers, we are committed to working with Latinos and Latinas of all national identity backgrounds, citizenship status or time in the US — in English, in Spanish or both. 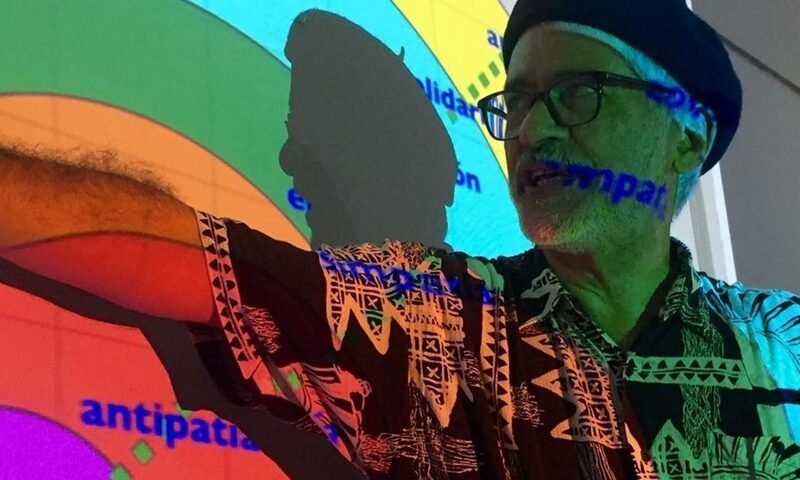 Since 1990, when we first began to design and facilitate antiracist, anti-oppression, decolonial and liberatory empowerment and leadership development programs for Latinxs, we have had to reckon with the unique challenges presented our identity, status, history and language in all of its complexity. We have trained and participated in workshops (both original as well as designed by others) in English and in Spanish, some with simultaneous interpretation provided. Over these three decades of experience, we have concluded that offering language interpretation for antiracism workshops, is not an effective tactic for recruiting Latinxs into antiracism movement, and is even much less so for organizing Latino communities. First of all, interpreted workshops are a headache. Literally. They make your head hurt. Everybody’s. Those being translated to. Those being interpreted. And those doing the interpretation, too! As well as everyone else in the room who has to bear with the constant murmuring in the room (or perhaps right next to you) while you’re trying to pay attention to learn some important information or to gain some potentially life-changing insight. The physical and mental imposition of a gadget on your head and a voice in your ear is not to be easily dismissed. Additionally, and more importantly, this indirect, mediated communication, most often through well-meaning, but inaccurate interpreters, tends to hinder, if not altogether impede, rapport, relationship and trust between trainers and participants, and throughout the circle of participants. Not only does it not elicit their full participation, but rather, it inhibits it. Not to mention, the times when people walk out of the workshop in total frustration because they understand enough English to know that their powerful and insightful contributions are being butchered by inadequately skilled interpreters. This could be avoided, to some extent, if host organizations could locate —and actually afford— a team of certified professional interpreters (alternating every 60 minutes, max!) who are also fluent in the often nuanced and carefully crafted language of antiracism organizing … steeped in historical, cultural, economic, sociological, psychological knowledge that is pan-American in scope … all at the tip of their tongue … in two languages! Many times we have been in interpreted sessions, used the headset to listen in, only to realize how inadequate (at times, infantile) the translation actually was. We have also even experienced a professional translator being totally overwhelmed by the technical language and admitting she could not keep up. On that occasion, we ended up having to do the interpretation — in addition to doing the training! On another occasion, a white East Coast community organizer was convinced she could provide language interpretation of an Undoing Racism workshop for a group of immigrants she worked with, only to end up stuck and having to ask for help from one of the trainers. The process was painfully slow and extremely frustrating, not to mention totally exhausting for the trainer in question. Within an international context of organizers from the US, Puerto Rico and East Asia (Okinawa, Japan, South Korea, The Philippines, Guam and Hawaii) from 2000 to 2012, we had to contend with the challenge of meeting with activists and women who spoke many different languages. In the process, we realized that language interpretation is a deeply political act. Interpretation in a truncated fashion, that is statement by statement, was deemed a disservice to the process and to the women involved. As people waited for their statements to be interpreted, they were unable to get into a natural flow of communication, vital energy and creativity was lost, and the process seemingly endless. Meanwhile, even with specialized audio equipment (including a portable soundproof booth for simultaneous interpretation), our interpreters ended up utterly frustrated as presenters would invariably forget they were being interpreted and forget to modify their normal, fluid or often fast speech patterns as accurate interpretation demands. Out of that experience, we came to develop a multilingual dictionary of technical terms to ease the process of interpretation and properly communicate across nationalities for future network events. Professional simultaneous interpretation may be well suited for presentations or speeches, perhaps at rallies or conferences, where the interpretation is primarily unidirectional (from one language to another), especially if its delivery is informed by antiracist anticolonial analysis. It can also be very useful in meetings or conversations between two or three persons. But our experiences in bilingual and multilingual contexts have taught us that language interpretation simply does not work well in antiracism workshops. Particularly given the dynamic dialogical nature —a core principle of our liberation pedagogy— of our two day-long training sessions. Therefore, not only do we do NOT recommend it: we strongly advocate against it. Moreover, in addition to these challenges, offering language interpretation for Spanish-dominant Latinxs in an English-language antiracism workshop would do little to nothing to support their gaining critical antiracism consciousness… or foster community organizing… or promote movement-building across racial groups. That level of transformative change requires that the workshop appropriately and effectively address the different cultural and historical contexts faced by Latin American immigrants within the political realities of the US today. And clearly, this is much more than an issue of language. Why does your organization/group want to reach out to Latinos? How does providing language interpretation of the workshop get you closer to those desired outcomes? Is language the real barrier that keeps Latinos from accessing and participating in the workshop and, moreover, from participating in your organization’s antiracism organizing? Can the organization locate and afford a team of certified professional interpreters who are also fluent in the precise and nuanced language of antiracism? If the workshop were to be conducted in Spanish, would the group’s English-monolinguals be okay with simultaneous interpretation and having to wear headsets for two full days? Where would this language interpretation approach be located along the antiracist Multicultural Organizational Development continuum? In our experience, organizations often seek to attract, recruit, retain and organize Latinxs across a very broad spectrum by offering language interpretation at workshops and events, all in good faith. Yet for a workshop of such complexity —and of significant cost— language interpretation often times has more to do with efficiency —getting more value for the organizations investment of effort (time) and resources (money)— than with effectiveness: doing what must be done that actually expands and strengthens our antiracism movement. Given our shared critical antiracist principles and analysis, therefore, one can conclude that the valuing efficiency over effectiveness is, indeed, a function of white culture, one that merely reproduces white supremacy. One can also conclude that the primary beneficiaries of language interpreted workshops (and services), then, are NOT Latino participants, but rather dominant culture (most often white) organizations, institutions and their members. Offering language interpretation, then, in effect, merely benefits the host organization (and quite possibly also the training organization) to the extent that they can claim to have a relationship with Latino community, albeit if only a superficial and fragile one. And while these groups may often be motivated by the positive intention to INCLUDE Latinos, they may well remain unaware of (or unconcerned with?) how this response is inadequate and, ultimately, serves to reproduce institutional and cultural racism. Meanwhile, Latinx participants —both non-English speakers and English speakers— may very well continue feeling marginalized, tokenized or, worse, used or abused. Furthermore, Latino communities will remain separate, if not absent, from antiracist struggle. This is why we offer two separate workshops: one in English for racially integrated groups, and one in Spanish for Spanish-dominant speakers. Even while the overall goals and content of both workshops are essentially the same, as is the historical analysis of racial oppression, the details, the emphasis, the lens and the approach in addressing the particular complexities of this segment of the overall Latino population calls for a separate, unique workshop process. Simply put, language interpretation would NOT support the fundamental purpose of the work! Realizing that a separate workshop for Spanish-dominant Latinxs would involve additional costs for groups with limited resources, we work with interested groups to explore ways to leverage the limited resources in order to make the two separate trainings feasible, whenever possible. This approach has been a most effective one on all fronts. An additional challenge of offering a non-interpreted Spanish-language workshop, and in many ways a more difficult challenge, is that doing so often requires people to confront long-held issues of trust. The “What are they talking about in Spanish?”, “Who are they talking about?”, or worse, “What are they saying about me?” is still pervasive in US culture, a racial attitude more common than one would hope for in this day and age. Issues of cross-racial trust remains a core antiracist challenge, even within the antiracism movement. We believe that providing this workshop in Spanish, with the support of multiracial antiracism partners, offers a powerful way to contribute to overcoming this obstacle and the building of solidarity. Naturally, the content and group process of such a workshop takes into account the possibility, or likelihood, that recent immigrant participants may have limited understanding or life experience of racism in the US, including but not limited to knowledge, perceptions, perspectives, relationships to Anglos/whites, Black US Americans and other People of Color — even concerning Latinos of other nationalities or those whose families have been in the US for generations. This setting also provides an environment in which the history and legacy of anti-Black bias within Latin American cultures can be examined in greater depth and transparency. This environment also allows for a more honest conversation about participants’ notions and experiences concerning “The American Dream” and their place in it. As is to be expected, engaging, organizing and building Latinxs leadership and advancing cross-racial solidarity in our movement will take a bit more time and a whole lot of love. It will also require thinking beyond tried and failed symbolic approaches and embracing knowledge, insight and creativity born from struggle. It is important to note that, with only one exception, all of these workshops were offered in English (the culturally dominant language) and interpreted into Spanish (the culturally subordinated language), clear examples of unexamined linguistic dominance. In 2007, the East Asia-US-Puerto Rico Women’s Network Against Militarism issued a statement together with this technical dictionary on the political and colonial nature of language interpretation. Developed by Dr. Bailey Jackson, and used in modified versions by Crossroads Ministry and The People’s Institute for Survival & Beyond.